Roofing Insulation: Should It Be Replaced Along With the Roof? Home » Roofing Insulation: Should It Be Replaced Along With the Roof? During roof replacement, roofing contractors usually strip the roofing down to the decking material and if the roof deck is in good condition, it’s kept as it is. Since the roof insulation is typically installed on the underside of the roof decking, you have the opportunity to have your roof insulation replaced. Signature Exteriors weighs the reasons on whether replacing the roof insulation is a good idea. 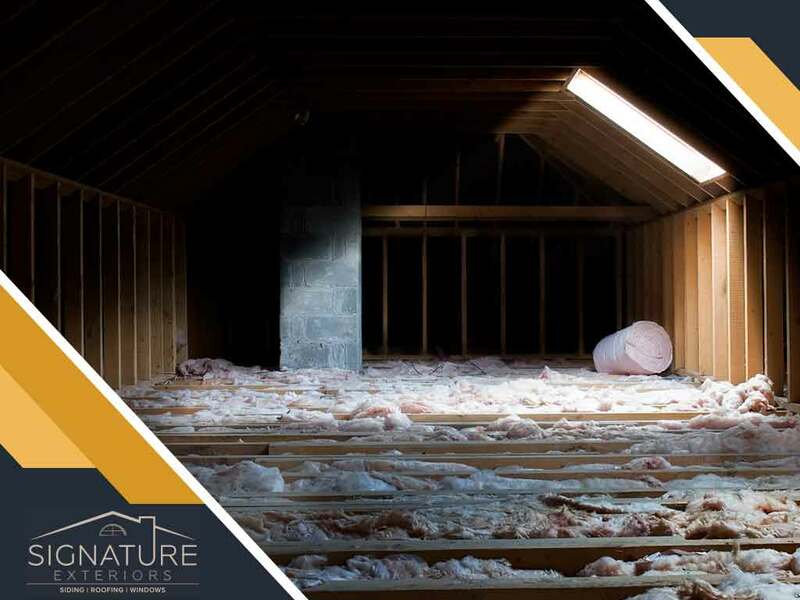 The roof and attic are part of your home’s energy envelope, which also consists of your exterior walls and all fenestrations. They’re intended to form an enclosure that allows minimal heat conduction. This means less heat loss during cold days and heat gain during hot days. This kind of enclosure reduces indoor heating and cooling requirements, resulting in significant energy savings all year round. Since most of the roof is exposed to the sun, the outer surface tends to absorb heat, which can be passed down into the energy envelope if not blocked at the roof. This is where roofing insulation comes in. By minimizing the amount of heat that passes through the roof, it complements the insulation in the exterior walls and fenestrations in maintaining stable interior temperatures. Roof insulation can be installed in more ways than one. A common method is spreading a layer of blown-in loose insulation over the attic floor. Another common method is the application of expanding foam insulation on the underside of the roof deck. There is also another, less common method that involves installing the insulation material on the roof deck, sandwiching it between the roofing felts. The latter two methods are preferred by homeowners who wish to extend the use of their attic space, perhaps for a future extension. Being so close to the roofing layer, there’s a good chance that the insulation will be damaged if the roof springs a leak. If your roofing contractor finds signs of water intrusion on the roof deck after stripping it, consider taking this opportunity to have the insulation replaced. It may cost extra, but it will ensure that your roof is contributing to your home’s energy efficiency. To learn more about our services as roofers, call Signature Exteriors today at (866) 244-8029. You can also fill out our contact form to schedule a free quote. We serve Stamford, CT and the surrounding areas.